Each of the two paired ovaries of the adult Drosophila female consists of a cluster of parallel ovarioles, where egg chambers are lying in a single-file arrangement (see Fig. 1A,B). 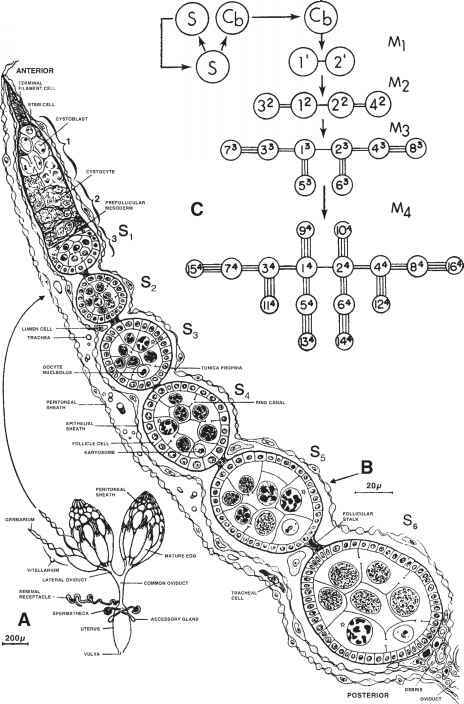 Each egg chamber contains a branching chain of 16 interconnected cystocytes formed by mitotic division of a germarial cystoblast (2). Fifteen of the cystocytes differentiate into endopolyploid nurse cells (NCs) (see Fig. 1C). The function of these germ-line-derived cells is to synthesize RNA and protein molecules, which they transport through a system of ring canals into the oocyte (3) (see also Chapter 4). resulting from yolk accumulation, starts at stage 8. By stage 9, NCs also develop unusual nucleoli composed of a shell of interconnected fibers around the periphery of the nucleus. NCs retain more rRNA genes than other polyploid cells and synthesize rRNA at proportionately higher rates (5,6). By stage 10, NCs reach their maximum size and DNA content (1024-2048C) (7). Stage 11 is the shortest and marks the beginning of the postvitellogenic period, with apoptosis of NCs, and the completion of the vitelline membrane. During stages 12-14, beta yolk forms, and the egg shell and its appendages are synthesized. The staging characteristics for Drosophila oogenesis were formulated after observations of Feulgen-stained, ovarian whole mounts (8) (see Subheading 3.1.). The NC nuclei in chambers belonging to stages 6-10 possessed a dispersed mass of Feulgen-positive threads (see Fig. 1B, S6). 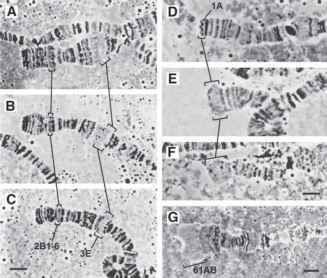 Nuclei in stages 3 and 4 contained densely staining bulbous structures (see Fig. 1B, S3 and S4). The NCs in stage 5 were at an obviously intermediate state. The nuclei nearest the oocyte contained dispersed chromosomes like those in stage 6, whereas the rest resembled stage 4. We know that the chromosomes in NCs undergo a cycle of endomitotic DNA replications (9). In NCs at stages 1-4, the paired homologs go through four endocycles, and the DNA is completely replicated each time with a total DNA content of 64C. At stage 5, the bivalents fall apart, starting with the NCs closest to the oocyte, and the polytene univalents subdivide further to form 32 separate chromatids, each containing the 2C amount of DNA and held together by unreplicated regions. There are three to four replication cycles, depending on the distance of the NC from the oocyte. During these cycles, which take place during stages 6-10, only about 90% of the DNA is replicated (9). Abbreviations: OAC = otu allelic composition; Q = quiescent germaria; T = ovarian tumors; P = PNC chambers; O = oocyte-NC chambers and mature eggs; AS = most advanced stage of oogenesis; APC = most advanced stage of polytene chromosomes; ARC = most advanced stage in replication cycle; P = pompons; HP = half-pompons; C = condensed; N = normal. a Number per 100 ovarioles; QTPO values for 7/7 and 11/11 were from flies reared at 18°C; values for 7/11 and 11/14 are for flies reared at 23°C. b Number of nuclei of each type observed on 20 slides prepared from 20 ovaries of flies of each genotype c No data available. Source: Data from refs. 13,17,18.